Information: Ivo Papazov, Bulgarian clarinetist and band leader. Born Ibryam Hapazov in Kurdzali, of Turkish Rom parentage. Changed his name to Ivo Papazov during the forced Slavicization of the Turkish minority in the 1980s. Hannibal/Ryko misspelled his name as Papasov when they issued "Orpheus Ascending" in 1989. Ryko perpetuated the mistake on Balkanology. Famous in the west as Papazov/Papasov, Ivo did not reclaim his natal name in 1989 when government policy changed, and neither did Trikiya's accordionist, Nesho Neshev/Nedyaytin Ibryamov or his sax, Yuri Yunakov/Hyusein Aliev. Ivo's friends and family still call him Ibryam or Ibryama "the Ibrjam." Balkanton  BHA 11188 Populyarni Trakiyski Klarinetisti (has Ivo Papazov  his first LP). 1983. 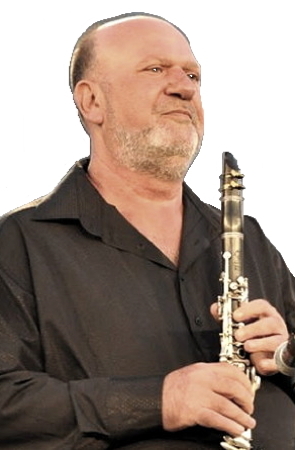 Balkanton  BHMC 7134  Ivo Papasov (Earlier; traditional; great clarinet). Balkanton  BHMC 7718  Space Folk  Petûr Ralchev; Ivo Papasov et al. Balkanton  BHMC 7719  Ivo  Petur and George. Balkanton  BTA 11859 Folk Dzhaz Bend  Plovdiv (Ivo Papazov's band playing his popular folk jazz). Hannibal  Orpheus Ascending. 1989. Unauthorized?  Turkish Music from Bulgaria  Popazov.